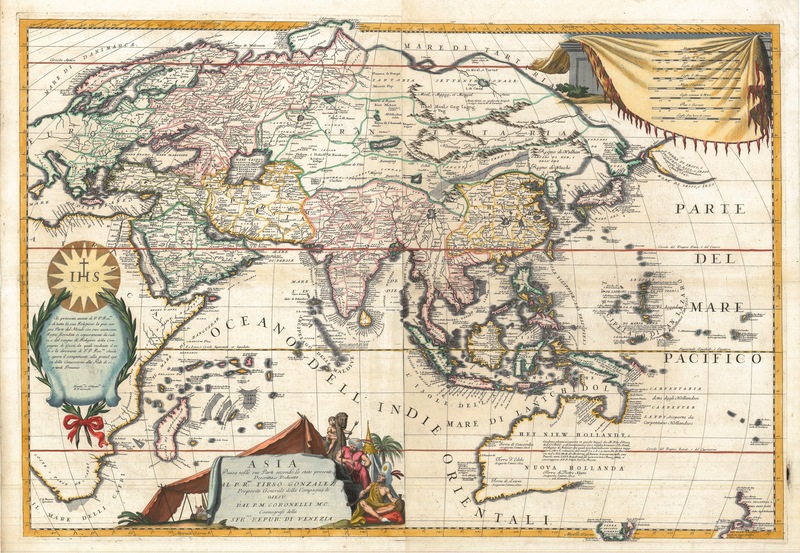 Antique map of Asia by Coronelli titled ‘ASIA/Diuisa nelle sue Parti second lo stato presente,/Descritta, e Dedicata/AL P. R:MO TIRSO GONZALEZ/Preposito Generale della Compagnia di/GIESÙ/DAL P. M. CORONELLI M.C./Cosmosgrafo della/SERMA REPUB: DI VENEZIA’. A beautifully engraved late 17th century Italian decorative double sheet map of Asia in old colour containing details of Abel Tasman’s discoveries in Australia between 1642 and 1644 as well as those made by Maarten de Vries to the north of Japan in 1643 by Father Vincenzo Maria Coronelli (1650-1718), Minorite friar at San Nicolo della lattuga, Venice, map and globe maker, Doctor of Theology, founder of the Academia Cosmografica degli Argonauti and from 1685, Cosmographer to the Republic of Venice. Sweet in his catalogue on Asia states that Coronelli probably collaborated with Tillemont producing this exceptionally accurate and up-to-date map. Jean Nicolas, sieur de Tillemont, usually referred to as Jean Nicolas Du Tralage (d. 1699), was a French geographer and map collector who revised Vincenzo Maria Coronelli’s maps for Jean Baptiste Nolin (1657-1708) between 1688 and 1689. It is surprising that Pedro Fernandez de Quiros’ (d.c. 1615) discovery of the New Hebrides c. 1605-1606 is not shown and that the map notes that New Zealand was discovered in 1654 and not the correct date of 1642. The discoveries from both of Tasman’s voyages in 1642-43 and 1644 are noted and Australia is given two titles: Het Niew Hollandt in Dutch and Nuova Hollanda in Italian. The two map sheets were published in Atlante veneto between 1690 and 1696 in Venice. Excellent condition with a strong plate mark; the two sheets have been expertly joined to make one map; measures 592 x 872 mm.